Like most types of law, practicing bankruptcy law involves much more than an understanding of legal standards and current case law. This program takes a different approach than the typical bankruptcy law course, focusing less on substantive law and more on the implementation of consumer bankruptcy law and how to deal with the real-world situations that your clients will bring you. It is a must-see for new and prospective bankruptcy attorneys. Excellent presentation. Lots of information and examples from real life practice of the speaker. Well worth the time spend. I expect to be able to use the materials in my practice. Thank you. Fantastic CLE. One of the best speakers I have heard in some time. Love this guy. I vote him as BEST presentor!! Very inspiring. The presenter obviously care and enjoys what he's doing. This presenter is the definition of what all lawyers should be pursuing the best interest of the clients. Makes me want to learn mobankruptcy law which I had no interesting in learning in law school! I'm not interested in bankruptcy law at all and this was still one of my all-time favorite CLEs! Really interesting, informative, and easy to listen to. Probably one of my favorite Lexvid classes. Super practical and informative. The instructor was incredibly engaging, and his passion about the area of law shined through the presentation. I feel like I retained a lot of what I heard, and was never bored, which almost never happens with a CLE. Great presenter. Solid presentation with practical information. Well done. Perfect for someone just getting into bankruptcy law! Born and raised in Brooklyn, NY, Daniel Gershburg always had an entrepreneurial spirit. After graduating New York Law school, Daniel immediately opened the doors to his own law office, hoping to change the way small attorneys are perceived. 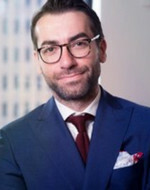 Besides being the Owner and President, Daniel is involved in various not for profit and Pro Bono initiatives including the Brooklyn Bar Association Volunteer Lawyers Project, and PENCIL.org. He teaches Bankruptcy and Real Estate law for various CLE providers, including LexisNexis, Lawline.com and NACLE.com.